The use of cultivated seaweeds as a feedstock for multiple industrial applications has gained increasing interest in the Western World over the past decades. Norway has an extensive coastline and a well-established aquaculture sector offering suitable preconditions for developing large-scale cultivation of seaweed biomass both in monoculture and in Integrated Multi-Trophic Aquaculture (IMTA) systems. Recent efforts from research, industry and public authorities have been committed to develop a Norwegian bio-economy based on cultivated seaweed, focusing on cultivation and processing of the biomass. This review reports on the status of seaweed aquaculture in Norway, supported by production data collected since the delivery of the first commercial cultivation permits at sea in 2014. Although novel product developments are currently limited, future industrial perspectives based on cultivated biomass are being discussed. Upscaling from experimental cultivation schemes to commercial production requires a thorough assessment of the risks and benefits associated with seaweed aquaculture, as well as the development of a regulative framework adapted to this industry. Issues associated with upscaling the macroalgal production that needs to be addressed includes (i) genetic interactions between cultivated and wild crops, (ii) impacts of seaweed cultivation on surrounding ecosystems, (iii) epiphytes and diseases, (iv) area utilization and (v) threats from climate change. Addressing these issues and adapting production practices will ensure the environmental and economic sustainability of an emerging industry based on cultivated seaweed biomass in Norway. Aquaculture has a great potential for meeting challenges of increasing demand for food. It is the fastest growing food production sector and accounts for almost 50% of aquatic resources globally (FAO 2016a). The world’s total aquaculture production in 2014 was in excess of 100 million t, of which 27 million t were aquatic plants, which are mostly seaweeds with a commercial value of 5.6 billion US$ (FAO 2016b). Global seaweed cultivation is largely dominated by Asian countries, i.e. China (producing more than 13 million t), Indonesia, The Philippines, North and South Korea and Japan. In these countries, the biomass is either used for direct human consumption (both fresh and dried), or it is further processed for other food applications (mainly phycocolloids such as alginates, agar and carrageenan). In addition, non-food applications include fertilizers, pharmaceuticals and cosmetics. Aside from having multiple industrial applications, brown, red and green seaweeds have other assets which make them suitable alternatives to terrestrial biomass production—as autotrophic organisms, marine macroalgae utilize dissolved carbon dioxide and nutrients (e.g. dissolved inorganic nitrogen and phosphorus) in combination with light for growth and do not require feed nor fertilizer. They can be cultivated on large scales in coastal areas with little or no demand on fresh water resources in production cycles. Moreover, the fact that macroalgal growth rates exceed those of terrestrial plants (Brinkhuis et al. 1987), have spurred the interest for cultivation of seaweed biomass, illustrated by a doubling of global production during the past decade (FAO 2016b). The rapid development of fed aquaculture (e.g. finfish or shrimps) is often associated with environmental concern regarding the discharge of nutrients to coastal areas, potentially leading to deterioration of local marine environments (Buschmann et al. 2006). Integrated multitrophic aquaculture (IMTA) systems represent a practical solution for mitigating the negative effects of fish farming wastes by utilising excess nutrients as a valuable resource for marine plant production (Chopin et al. 2008). Seaweeds in such integrated cultivation systems, e.g. in proximity to fish farms, function as extractive components within a cultivation food web. In addition to reducing the environmental impact of intensive fish aquaculture, IMTA systems add value to the investment in finfish aquaculture by increasing the yield of total biomass produced on a single site (Chopin et al. 2001; Neori et al. 2004; Troell et al. 2009; Chopin et al. 2012). For more than five decades, seaweeds have been the subject of considerable industrial utilization in Norway based on harvesting of natural biomass. Harvested wild seaweed biomass of primarily Laminaria hyperborea (commonly known as ‘forest kelp’, Northern kelp’ or ‘cuvie’) but also Ascophyllum nodosum (knotted wrack) amounted to over 154,000 t fresh weight in 2014 (FAO 2016b). Harvesting of wild L. hyperborea, using specifically designed trawling equipment, remains somewhat controversial as the removal of and interference with natural habitats (specifically kelp forests) has the potential to affect local biodiversity and ecosystem integrity, and may contribute to coastal erosion (Mork 1996; Christie et al. 1998; Christie et al. 2003; Lorentsen et al. 2010; Smale et al. 2013). Although Norwegian management regimes for seaweed harvesting are considered to be among the best in the world (Smale et al. 2013), regional conflicts persist between the seaweed trawling industry and other coastal zone users (representing for instance coastal fisheries, marine conservation groups and ornithologists). Even with positive developments in knowledge-based integrated coastal zone management with broad stakeholder involvement, and the consideration of a prospective geographic expansion of kelp trawling areas northward, it is not foreseen that future harvesting of wild kelp biomass will be able to meet the growing demands of an industry that is mainly producing alginate from L. hyperborea. Norway’s long and complex coastline extending over 100,000 km and characterized by fjords, islands and skerries is highly suited for aquaculture. The cold temperate waters of the Northeast Atlantic are home to more than 400 species of brown, red and green seaweeds (Rueness 1998), many of which have recognized commercial value. Norway is the world’s second largest exporter of seafood and has natural advantages which create opportunities to increase seafood production through aquaculture. In 2015, 1.38 million t of salmon and trout were farmed in Norway (Statistisk Sentralbyrå 2016). As salmon and trout production in Norway is predicted to increase by approximately 3 to 5% per year (Olafsen et al. 2012) over the coming decades, measures must be taken to limit the negative effects of excess nutrient discharge, especially environmental eutrophication and resulting ecological degradation and biodiversity loss. In addition, finite global phosphorus resources (Cordell and White 2011) provide a powerful argument for recovering excess nutrients, specifically phosphorus, from all sources including aquaculture and in view of their high value. The benefit of employing IMTA in this context, i.e. recovering organic and inorganic nutrients discharged from fish farms, is emphasized in a study by Wang et al. (2012) which highlights the potential for seaweed production in Norway, based on the estimated total amount of dissolved inorganic nutrients released by salmon farms. In this context, the development of seaweed aquaculture in Norway is in line with the European strategy driving ‘Blue Growth’ initiatives (European Commission 2012). Experimental cultivation of kelps (Laminariales) at sea in Norway started around 2005 following successful trials conducted in France, Germany, Ireland and Scotland. Joint efforts of key actors from both research and private sectors primarily focused on developing cultivation technology in order to upscale the biomass production. Current efforts regarding the industrial scale production of seaweeds, mainly sugar kelp (Saccharina latissima), are now being directed at developing efficient farming strategies that reduce the need for technical maintenance, along with marine technology, including mechanisation of seedling deployment, biomass harvest and crop handling logistics (MACROSEA, www.sintef.no/projectweb/macrosea/). Efficient cultivation technology along with access to sufficient area at sea is a prerequisite for the sustainable development of an industry based on the utilization of seaweed biomass. Although activities to date have been characterised by research and pilot scale production, the first commercial permits for cultivation of seaweeds were granted in 2014 following the creation of a specific–interim-licensing system for macroalgae by public authorities. The Ministry of Trade, Industry and Fisheries coordinates the processing of seaweed farming applications and considers them according to the Aquaculture Act. The evaluation of applications involves several authorities, including the Directorate of Fisheries, The Norwegian Coastal Administration, the Norwegian Food Safety Authority, The County Governor’s Environmental Department and The Norwegian Water Resources and Energy Directorate, each one considering potential conflicts of the application within their area of responsibility. Whether the seaweed farm is in concordance with coastal zone spatial plans, is considered by the concerned municipal authorities, as coastal zone management lies within the municipalities’ responsibility. Since 2014, several permits for sea cultivation of seaweeds, including in IMTA systems, have been granted following the rapid increase in the number of private actors involved in this activity (Table 1). The surface allocated to seaweed cultivation has more than tripled between 2014 and 2016, currently reaching a total of ca. 277 ha along the entire Norwegian coast and corresponding to a production potential of approximately 16,000 t (as estimated from the total maximum production by applicants on each cultivation sites). However, this potential by far exceeds the real production output, given that most companies involved in this activity are at a start-up phase characterized by experimental production. In fact, only 10 of 16 companies holding a cultivation permit were operating in 2015 (Directorate of Fisheries 2016a, 2016b). In Norway as in the rest of Europe, efforts for large-scale cultivation of seaweed biomass have been focussing largely on kelp species, particularly S. latissima, because of the species’ potential for high biomass yields (Kraan et al. 2000; Handå et al. 2013) and valuable nutritional content (Schiener et al. 2015). The cultivation of S. latissima represented 96% (49 t wet weight) of the total production output, while cultivation of winged kelp (Alaria esculenta) represented the remaining 4% (2 t wet weight). Although licences for cultivation of a wide range of species (e.g. Palmaria palmata, Ulva spp., Laminaria digitata, Porphyra spp.) were granted, none of these are currently cultivated at sea. Given the data reported by the Directorate of Fisheries (2016b) for the year 2015, the retail value of S. latissima and A. esculenta was 399 US$ t−1 and 1099 US$ t−1, respectively. Although no information is available regarding the retail markets of the produced biomass, A. esculenta is often sold in dried or fresh form as a high value food ingredient or sea vegetable whereas S. latissima has a broader range of market outputs, e.g. dried for human consumption or as meal in animal feed, which may explain the difference in market value. A higher value for A. esculenta may also simply result from a lower biomass availability on the market. As a comparison, retail value of the global seaweed production output is estimated to 206 US$ t−1 in 2014 based on figures mentioned earlier (FAO 2016b). Despite a long coastline and an increase in the number of permits at sea, seaweed cultivation sites are still scarce and not evenly distributed along the Norwegian coast (Fig. 1). A very large part of the allocated surface area (87%) shared by 28 cultivation sites is concentrated on ten municipalities, localized in few counties, namely Hordaland and Sogn and Fjordane in the west, Sør- and Nord-Trøndelag in the mid-part and Nordland in the northern part of the country. Hence, there is a large potential to establish seaweed cultivation in other areas, especially the Møre and Romsdal county in the west, as well as Troms and Finnmark counties in the north, both of which are characterized by extensive areas and the presence of salmon aquaculture (see possibilities for integration of seaweed and salmon farming above). At present, only a few of the existing cultivation sites are in the vicinity of fish farms, hence characterized as IMTA. Most of the so-called IMTA sites were developed as ‘add-on’ to a pre-existing fish farm and to date, few have been fully designed for the purpose of fish and seaweed co-culture. However, many sites of seaweed monoculture are located in areas of intense salmon production (Directorate of Fisheries’ interactive map: http://kart.fiskeridir.no/default.aspx?gui=1&lang=2) thus, are likely to directly benefit from nutrient releases originating from fish farming activities. The cultivation cycle of the kelp species is based on their life cycle (see Bartsch et al. 2008 for more details on the life cycle of the Laminariales). Sporelings are grown from microscopic stages i.e. zoospores or gametophytes (derived from zoospores) under controlled conditions and directly seeded onto appropriate substrata (e.g. twine, nets, ribbons, sheets) which are later on deployed at sea for further growth under natural conditions. Although the production of spores in natural kelp populations is seasonal and species-specific (Bartsch et al. 2008), sorus (reproductive structure) formation can be induced artificially by, for example, controlling the light regimes provided to adult sporophytes. In this way, viable sporelings can be produced at all seasons (Forbord et al. 2012). However, biofouling of the biomass from epiphytic organisms limits the cultivation period at sea from autumn to spring (see Risk assessment 1—epiphytes and diseases). Seaweed cultivation has been subject to increasing interest in Europe over the past decades, and activities have benefited from recent trends towards a bio-economy based on natural, and especially marine, biological resources. In Norway, research efforts to develop seaweed cultivation and processing technology were driven initially by the interest for producing bioenergy from seaweed’s carbohydrates. However, the production of biofuel and biogas on commercial scales is impaired by the difficulties associated with producing large biomass volumes, since neither cultivation technology nor access to aquaculture sites at sea have yet been sufficiently developed for large-scale production. In addition, the market value for seaweed biomass as biofuel is low compared with other product types (Skjermo et al. 2014). Seaweed biomass is a rich source of a wide range of bioactive products of potentially high market value (Holdt and Kraan 2011). Relevant applications include (i) human food, (ii) domestic animal and fish feed products, (iii) fertilizer, (iv) prebiotics, (v) cosmetics, (vi) bioactive peptides and (vii) pharmaceuticals and nutraceuticals, and these are predicted to play an important role in the emerging Norwegian bio-economy based on seaweed cultivation (Skjermo et al. 2014). In the past, mainly brown algae have been utilised in Norway. Primary applications have been alginates (used as food additives, health products and bio-medicinal ingredients, to name just a few) or agricultural products (i.e. animal feed supplement and soil enhancers/ fertilizers). In most cases, the seaweeds have been used for the functional properties of their polysaccharides or their mineral content. Although the seaweed chemical composition is variable depending on species, collection time and habitat, the nutritional value of several species is well characterized. Most species share a low lipid content on the one hand, while being rich in polysaccharides (both structural and storage, Dawczynski et al. 2007) and minerals on the other (Mabeau and Fleurence 1993; Rupérez 2002; MacArtain et al. 2007; Pereira 2011). Other nutritional properties, such as a relatively high protein content and high quality profiles of amino-acids (Fleurence 2004; Mæhre et al. 2014), lipids (Sánchez-Machado et al. 2004) and minerals (Cofrades et al. 2008; López-López et al. 2009) are highly relevant towards food and feed applications. Positive effects of including seaweeds in feed meals have been reported for both, marine and terrestrial organisms (Soler-Vila et al. 2009; Kandasamy et al. 2012; Evans and Critchley 2014; Wilke et al. 2015), and several feed products based on powdered dried seaweed are commercially available. Seaweeds have traditionally been a major element of the diet in Asian countries and are used extensively as food in China, Japan, Korea and the Philippines where they are recognized for their nutritional value as well as for rich and unique flavours. In Europe, traditions of eating seaweeds have been limited to coastal communities, and over the past centuries, few regions have had an explicit culture for utilising seaweeds as a significant component of the people’s diet. The use of seaweeds as food in Norway goes back to the Vikings who likely brought dried dulse on long expeditions at sea for its virtues in protecting against scurvy, following its high content of vitamins (Mouritsen et al. 2013). In recent decades, Asian dishes such as sushi, have enjoyed increasing popularity and contributed to introducing seaweeds to European palates. In Scandinavia, the renewal of the Nordic cuisine initiated by high-end restaurants and based on locally available natural ingredients has aroused interest for including seaweeds in the gastronomy (Mouritsen et al. 2012). Previous studies have revealed the potential of seaweed species native to the Atlantic coast of Europe (e.g. the red algae P. palmata and the kelps S. latissima and A. esculenta) to be used as food ingredients in a wide range of foodstuffs both as vegetables and flavour enhancers (Mouritsen et al. 2012; Chapman et al. 2015). In Western Europe, i.e. France, Ireland, Spain and UK, a number of small and medium-sized enterprises are using wild or cultivated seaweeds in food products. This new type of businesses has developed in recent years following the rising demand from European consumers (NETALGAE 2012). In France, edible seaweeds e.g. S. latissima, P. palmata, Undaria pinnatifida and Himanthalia elongata are sold in fresh or dried form, as “sea vegetables” or condiments, or are incorporated in various product types (e.g. spreads, dressings, soups) as identified by Le Bras et al. (2015a, 2015b) in a comprehensive study among a wide range of retailers across the country. The retail price of these products, mainly sold in organic or health food shops, varies greatly with product category, seaweed species and the amount of seaweed used, but the identified market value is generally high i.e. over 100 € kg−1 (ca. 105 US$ kg−1) on average for dried and flaked seaweeds (Le Bras et al. 2015b) . Although there is no data available regarding seaweed consumption in Norway, it is truly marginal, and few Nordic seaweed food products are currently available. The development of such ‘niche’ food products, based on market and consumer insight, can contribute to creating value from Norwegian produced seaweed biomass on a relative short-term. Thoroughly investigating the food safety of commercialized edible seaweeds (see Risk assessment 2—product related) is, however, essential. Moreover, seaweeds contain a large variety of phytochemical constituents that can be used in the prevention and treatment of health diseases by various mechanisms (Holdt and Kraan 2011; Brown et al. 2014). Bioactive compounds of interest include polysaccharides (e.g. alginates, fucoidans), polyphenols and pigments, to name just a few. Besides being used mainly in the food industry as thickening or emulsifying agent, alginates are regarded as a source of dietary fibre with beneficial effects both on colonic and cardiovascular health (Brownlee et al. 2005). Alginate polymers can be artificially modified to achieve tailored properties suited in various medical applications including cell micro-encapsulation, tissue engineering and regeneration, and dental impressions (Ruvinov and Cohen 2016). The company leading the alginate production in Norway (FMC BioPolymer) manufactures ultrapure alginate from wild Laminaria hyperborea for research and high-end commercial applications. The same firm recently obtained the authorization to commercialize high purity extracts of fucoidan as a dietary ingredient. Fucoidan represents a group of polysaccharides from brown seaweeds, mainly composed of sulfated fucose with documented bioactivity (Berteau and Mulloy 2003). Other compounds which are currently not commercially exploited in Norway may offer industrial opportunities in the future. Carotenoid pigments from brown algae, namely fucoxanthin, are recognized for their antioxidant activity as well as positive health effects against obesity and type-2 diabetes (Maeda 2015), and can be found in dietary supplements and nutraceuticals. Phycoerythrin, a pigment from red algae, is used extensively in fluorescent applications in clinical and immunological analysis as well as natural dye in the food and cosmetic industry (Sekar and Chandramohan 2008). Extraction procedures of this pigment using common species along the Atlantic coast of Europe, e.g. P. palmata, have been suggested (Galland-Irmouli et al. 2000; Dumay et al. 2013) together with methodology for industrial upscaling (Denis et al. 2009). Polyphenols are secondary metabolites which are abundant in brown seaweeds such as A. nodosum, Fucus spp., and widely recognized for their antioxidant properties (Wang et al. 2009; Tierney et al. 2013). Polyphenol-rich extracts from brown algae have inhibitory effects against lipid oxidation in fish (Wang et al. 2010) and fish oil (Xiaojun et al. 1996). Hence, polyphenols may provide a safer alternative to synthetic commercial antioxidants such as butylated hydroxytoluene (BHT), butylated hydroxyanisole (BHA) and tert-butyl hydroxyquinone (TBHQ) which are currently used in the food and feed industry, and criticized for their potential toxicity and carcinogenic effects (Gupta and Abu-Ghannam 2011). The commercial exploitation of such high value-added products will require relatively low biomass volumes in comparison to bulk products (e.g. biofuels) and is predicted to generate economic value from cultivated macroalgal biomass (Holdt and Kraan 2011; Skjermo et al. 2014). However, the extraction of these substances is technology demanding thus, associated with high investment costs. More knowledge is also required regarding the market potential of seaweed bioactive compounds to identify commercial opportunities. In contrast to current processes in the Norwegian alginate industry, in which only a fraction of the harvested biomass is utilized and by-products are discarded, recent trends towards bio-economy favour complete utilization of produced biomass, recycling of nutrients in complete cycles and hence, reducing negative environmental impacts. Integrated processes maximizing biomass utilization by recovering a stream of products from seaweed biomass have been studied with promising results (Hou et al. 2015; Baghel et al. 2016). An increasing number of initiatives involving both research and industrial partners are aiming to develop biorefinery processes of marine macroalgae in Norway, in order to optimize feedstock utilization towards a wide range of products. However, the high water content of seaweeds (70 to 90%, Jensen 1993) represents a challenge for conserving and transporting large amounts of biomass (as in industrial production) from harvesting to processing sites. Seaweeds are characterized by a rapid microbial decomposition once harvested (Enríquez et al. 1993), and thus require appropriate preservation methods to maintain biomass quality and ensure product safety. Primary processes such as drying can effectively stabilize the biomass but require technology and may be difficult to implement close to harvesting sites for large biomass volumes. Drying also affects the chemical content (Chan et al. 1997; Gupta et al. 2011) with consequences for the product’s nutritional value as well as extraction yields of bioactive compounds during further processing. Post-harvest treatments that will contribute to maintaining biomass quality include seawater storage (Paull and Chen 2008), cold storage (Liot et al. 1993), silage (Herrmann et al. 2015) and freezing (Choi et al. 2012). A recent study by Broch et al. (2016) stressed that large-scale seaweed cultivation sets standards for efficient logistic strategies and suggests the use of energy surplus from existing industrial facilities along the coast for processing of large biomass volumes. Another national research project investigates the possibilities for using energy surplus from a waste incinerator located on the west coast of Norway for seaweed processing, including its technical, economic and logistic potential (PROMAC, www.promac.no/). Despite a growing interest for seaweed cultivation in the western world and a wide range of industrial applications globally, the tools and methods for establishing a seaweed industry in Norway—whether they are technical, economic, environmental, social or regulatory—still need to be developed or adapted from Asian models to fit European frameworks. 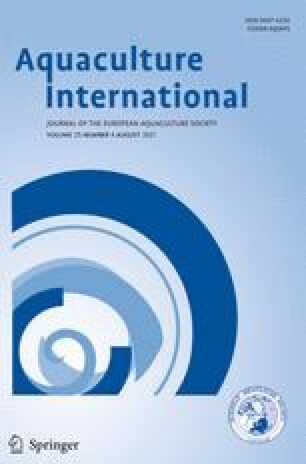 This will help aquaculture enterprises and policy makers gain a better understanding of the risks and benefits associated with seaweed cultivation in both monoculture and IMTA systems, and provide conditions suitable for the development of a sustainable bioeconomy based on macroalgal biomass. By cultivating extractive species (e.g. seaweeds) near fish farms, IMTA systems increase the biomass production of an aquaculture site associated with a certain area license. Whereas seaweed cultivation integrated with fish farms is currently being viewed as an experimental ‘add-on’ to existing aquaculture sites of salmonid fishes, the potential of seaweed production for improving environmental and economic performance of fish aquaculture and consequently increasing biomass production, is significant. The regulatory frameworks largely differ among species (i.e. fish, seaweed, shellfish) and are non-existent for species combinations (particularly concerning the integration of finfish, shellfish and seaweed production). The current interim regulatory process in use includes seaweed cultivations and IMTA systems, but needs to be specifically adapted for the various seaweed farming scenarios. An adaptation of the legal framework needs to achieve the transition from fed-monoculture (fish or shellfish) to poly- and integrated aquaculture (Alexander et al. 2015). In addition, the adaptation of existing regulations and policies for IMTA will demand an assessment of the risks and benefits of developing new aquaculture systems or using new aquaculture species. The “Strategy for an Environmentally Sustainable Norwegian Aquaculture Industry” (Ministry of Fisheries and Coastal affairs 2009) provides a guideline for current Norwegian aquaculture policies, focusing on five key problem areas, i.e. (i) genetic interaction and escape, (ii) pollution and emissions, (iii) disease, (iv) area utilization and (v) feed and feed resources. Whereas these policies were designed for fish aquaculture, they are equally relevant for seaweed cultivation, and are discussed below in this context. There are several infamous cases of accidental introductions of non-native seaweed species to new coastal environments, e.g. Undaria pinnatifida and Sargassum muticum to Western Europe and Caulerpa taxifolia to the Mediterranean Sea, which have resulted in massive population explosions of the non-native species and consequently significant ecosystem alterations. Because spreading of non-native species can have large environmental and economic impacts (Schaffelke et al. 2006), their intentional use in mariculture must be prevented. Though seaweeds have been exploited in Asia for centuries, selective breeding of crops is a relatively recent practice, carried out for the purpose of increasing yields and/or value by optimizing seaweed growth, improving the biomass’ general quality or increasing the content of one or several desirable compounds, as well as improving performance towards pathogens and competitors. Commercial varieties of Saccharina japonica (Zhang et al. 2007) as well as eucheumoid species like Kappaphycus alvarezii and Eucheuma denticulatum (Ask and Azanza 2002) illustrate successful efforts towards seaweed crop improvement. However, crop selection and the use of the selected varieties on a large scale may lead to gene swamping, where genetic material from cultivated crops is introduced to wild populations (Snow et al. 2010). The genetic structure and degrees of isolation between populations of species that are relevant for aquaculture in Norway are still poorly understood. Recent studies conducted on kelp species showed increasing genetic isolation correlated with distance among populations. Water current patterns were identified as the primary force responsible for spreading of dispersal stages, resulting in gene flow among populations (Alberto et al. 2011; Robuchon et al. 2014). High extent of isolation may lead to phenotypic differences among populations, which can be affected by selection. Accordingly, Futsæter and Rueness (1985) reported morphological differences between sugar kelps from Northern and Southern Norway, as well as differences in growth under certain conditions. In this regard, the use and spreading of crop material along the coast of Norway must be regulated to limit the effects of “crop-to-wild” gene flows. Fredriksen and Sjøtun (2015) recommended using local ecotypes for crop breeding and restricting the produced crops within fjord systems and coastal areas defined by the eco-region based map catalogue from the Norwegian Environment Agency (Miljødirektoratet, https://kartkatalog.miljodirektoratet.no/Dataset/Details/501). Sterilization technologies for cultivated seaweeds have also been suggested as a measure to mitigate gene swamping (Loureiro et al. 2015), but examples of supposedly sterile aquaculture organisms adapting over time and eventually being able to reproduce after all (Jouaux et al. 2010) advise caution in such cases. As organisms which take up dissolved nutrients from surrounding seawater, seaweeds function as extractive components in culture systems. Thus, they assimilate dissolved inorganic nitrogen and phosphorus, which, in many coastal ecosystems, originate from terrestrial runoffs or from fish farming activities. In this way, seaweed cultivations can mitigate potential eutrophication of coastal environments (Kim et al. 2015). In addition to nutrients, seaweeds assimilate dissolved carbon in form of CO2 as part of the photosynthetic processes. Pedersen et al. (2012) estimated the annual production of a Norwegian kelp forest (L. hyperborea) as between 14 and 25 t ha−1 dry weight, corresponding to 5.6 to 10 t ha−1 of carbon-bound biomass growth, ranking these kelp forests among the most productive vegetation systems on earth. Chung et al. (2013) estimated the potential of the brown alga Ecklonia cava cultivated on ropes to extract approximately 10 t CO2 ha−1 year−1. Large-scale seaweed cultivation is justifiably regarded as a potential temporary CO2 sink and may contribute substantially to the management of human impacts on atmospheric and oceanic carbon cycle interactions. Seaweed cultivations create a temporary habitat for invertebrates and fishes, increasing habitat complexity, possibly functioning as artificial reefs and contributing to ecological interactions within nearby ecosystems. Although such an effect has not been systematically investigated, seaweed cultivation fields have been observed to house associated biota, i.e. mobile drifting or swimming organisms and attached fauna and flora (Stamenic 2015). These observations indicate an overall positive effect on local biodiversity, but environmental monitoring over time will provide evidence. Similarly, benthic environments associated with seaweed cultivations are bound to be altered, and the effects need to be documented systematically. An ongoing research project in collaboration with Norwegian fish farmers (TARELAKS, contact Céline Rebours) is addressing ecosystem effects of co-cultivation of seaweeds and salmonids at pilot IMTA-sites. In this context, the effects of seaweeds on water quality (e.g. current speed, dissolved nutrient content, chlorophyll a content) and fish health parameters, as well as on biological diversity near the seaweed cultivation sites are being assessed. Preliminary observations obtained from a Norwegian farm in a European project (IDREEM, www.idreem.eu/) indicate high abundances of juvenile fishes associated with macroalgae cultivations (Hughes et al. 2016). Especially lumpfish, Cyclopterus lumpus, appear to be common in seaweed farms (Stamenic 2015). This is a potentially valuable association, as lump suckers are being used as cleaning fish in salmon farms to remove parasites (salmon lice) from the farmed fish. Salmon lice infestations represent one of the major challenges facing the salmon aquaculture industry in Norway, and developing biological controls is a priority. Nutrient transfers form seaweeds and kelp forests to other ecosystems are key processes in nature, increasing food availability to otherwise nutrient-poor environments (Vetter 1995; Krumhansl and Scheibling 2012). However, besides acting as a temporary nutrient sink and having potentially positive effects on surrounding pelagic environments, large-scale seaweed cultivations may also cause high material deposits on the seafloor which could have adverse consequences on benthic ecosystems and biodiversity through decomposition processes and associated oxygen depletion (Viaroli et al. 2008). In addition, physical shading of both pelagic and benthic ecosystem by large-scale seaweed cultivation may affect primary production in the case of shallow inshore areas, although these effects have not yet been studied. Problems with pathogens and epiphytes of seaweeds may arise in large-scale and high-density cultivations. In Norway, the presence of epiphytic invertebrates, especially bryozoans (e.g. Membranipora membranacea and Electra pilosa), but also blue mussels (Mytilus edulis), hydroids and fouling macroalgae has been reported for sugar kelp cultivated at sea during summer months (Forbord et al. 2012; Handå et al. 2013; Lüning and Mortensen 2015; Førde et al. 2016). In worst case scenarios, such fouling may lead to extensive blade damage and loss of biomass or considerable quality deterioration. Whereas, the diversity of associated organisms in natural kelps beds carries important ecological functions in coastal areas (Christie et al. 2009), biofouling by epiphytes is a major constraint for the year-round cultivation of seaweed biomass, forcing producers to harvest in May–June, hence limiting the year-round seaweed cultivation at sea (Forbord et al. 2012; Peteiro and Freire 2013; Førde et al. 2016). Outbreaks of encrusting colonies of the bryozoan M. membranacea are the result of settlement of cyphonaut larvae, which are present in the water column of coastal area throughout the year (Ryland 1965; Saier and Chapman 2004) with a peak of abundance during the summer (Ryland 1965; Førde et al. 2016). Larval recruitment and the extent of biofouling which may vary among cultivation sites, are linked to zooplankton population dynamics, influenced by a wide range of both biotic and abiotic factors including the temperature history and wave action (Saunders and Metaxas 2008). Seawater temperature seems to play an important role since the onset of fouling is somewhat delayed at higher latitudes (Fieler and Matsson 2015). However, the same time delay is observed for growth of kelps, with growth seasons extended into late summer in Northern Norway, compared to more southern locations. Hence, the growing season for cultivated sugar kelp is limited from October to May in Southern Norway, and possibly to August in Northern Norway (Fieler and Matsson 2015), and the crops must be harvested before the onset of fouling. In the case of IMTA, the peak nutrient release from fish farms occurs during the summer months, due to high metabolic activity and growth of the fish (Wang et al. 2012). Developing crops resistant to fouling or alternative seaweed species as summer crops, is key to increasing the production efficiency in IMTA systems. Seaweed production in IMTA systems will also alter the surrounding water quality and the fish-rearing environment in general, e.g. by changing the oxygen content resulting from photosynthesis and respiration, as well as hydrographic regimes to the fish cages. Large-scale seaweed cultivation may also influence fish health indirectly either by acting as a physical and/or biological barrier for pathogens, or in the opposite case, as a reservoir for fish disease agents. Whereas, evidence from IMTA sites elsewhere indicates many benefits, both on conceptual, practical, environmental and economic levels (Barrington et al. 2008; Chopin et al. 2012), potential risks associated with integrated fish and seaweed production need to be evaluated and assessed in the context of specific geography, production systems (regarding both fish and seaweed), scales of production and associated technology. Such issues are also addressed in on-going research projects in Norway. A special commission mandated by the Norwegian Ministry of Trade, Industry and Fisheries stressed that a sufficient number of locations must be assigned to aquaculture with focus on efficient production and minimal environmental impact (Gullestad 2011). An economically viable seaweed aquaculture sector requires large areas for cultivation which may lead to conflicts with other users of the coastal zone. Integrated management tools applied across municipal boundaries are therefore necessary to avoid conflicts between seaweed cultivation on the one hand and other uses, including fisheries, fairways, nature protection, renewable energy production, kelp trawling areas as well as oil and gas installations on the other (Broch et al. 2016). Although the current demand for seaweed biomass can be met by cultivation sites in the Norwegian coastal zone, model simulations including environmental variables critical to seaweed growth (e.g. light intensity, nutrient, temperature and current speed) showed better and more stable conditions off the continental shelf than closer to the coast (Broch et al. 2016). The modelling study by Broch et al. (2016) was carried out for the coast of Møre and Romsdal county with an overall conclusion of a prospective upscaling of seaweed biomass production placed offshore. However, offshore working environments entail technical challenges including mooring of the cultivation structures as well as logistic aspects from deployment of seedlings at sea to harvesting and processing of the biomass. Knowledge and competence transfer from existing maritime industries (e.g. oil and gas) is pointed out by the authors as a key factor for the success of the future offshore seaweed production. Climate change is likely to impose threats to marine ecosystems and consequently aquaculture. Rising sea temperatures could eventually lead to significant changes both in terms of aquaculture species, optimal range for the production and localization patterns. Higher sea temperatures will involve a relocation of the boundaries of the distribution of organisms in the ocean, including seaweeds, and the general northern displacement of farmed organisms (NOU 2010). Higher summer sea surface temperatures may be problematic for farmed species that are adapted for life in cold water. As a result, the productivity of aquaculture species can be affected, and Southern Norway may be less suitable for species such as salmon, with socio-economic impacts (Hermansen and Heen 2012). Such climatic changes may eventually entail that northern areas will be better suited for mariculture than southern regions (Bergh et al. 2007). A study by Callaway et al. (2012) assessing the consequences of climate change on aquaculture species in the UK and Ireland, suggested that elevated sea temperatures and changes in hydrodynamic regimes will impact macroalgal cultivation; however, impacts will likely vary according to species and geographic locations. It is therefore particularly important to investigate the framework conditions for seaweed monoculture and IMTA along the entire Norwegian coast. In contrast to the many features of seaweeds beneficial for human health and nutrition, seaweeds may also accumulate undesired compounds such as heavy metals (lead, mercury, cadmium, arsenic) as well as minerals and trace elements which may be toxic above a certain limit (iodine, manganese, zinc) (Almela et al. 2006; Rose et al. 2007; Besada et al. 2009). Variations in content and concentrations of undesirable and toxic compounds are dependent on species (Phaneuf et al. 1999), seasons and locations (Ar Gall et al. 2004), and in general, levels of toxic compounds are often related to the quality of the surrounding environment of harvested or cultivated seaweeds. However, few studies about negative consequences of consuming seaweeds have been carried out, but among the best documented are effects of high iodine content in some brown algae (Lüning and Mortensen 2015; Desideri et al. 2016). The potentially mitigating effects of primary processing of edible seaweeds on their content of toxins as well as antinutrients (i.e. compounds reducing digestibility and bio-availability of health-advancing ingredients) and on their microbial stability require further investigation. Current research efforts in collaboration with the Norwegian Food Safety Authority (Duincker et al. 2016) are addressing these relevant questions in order to establish a regulatory framework for the use of macroalgae as human food and animal feed. Such a regulatory framework is a prerequisite for further industrial development of seaweeds as raw material for human consumption and animal production. The seaweed industry is a growing economic sector in Norway. Both research communities, public and private stakeholders are collaborating to further the sustainable development of the Norwegian bio-economy based on cultivated seaweed biomass. Although cultivation technology has come a long way, it still requires optimization to upscale the biomass production and reduce the need for technical operators as well as maintenance. Current needs from seaweed producers are directed towards energy efficient processing standards that will maintain or increase product quality, ensure consumer safety and maximize biomass utilization. Integrated models using industrial surplus heat as energy source for seaweed processing are suggested, and their feasibility are currently under study. Despite a large body of scientific literature reporting on the quality of macroalgal phytochemical constituents, commercial outputs from Norwegian cultivated seaweeds are currently limited. High-value products to be used in food, cosmetics as well as medical and pharmaceutical applications, are predicted to play an important role in creating value from Norwegian cultivated seaweed biomass. Nevertheless, expert knowledge regarding markets and prices for different seaweed products is required in order to establish market strategies. Successful product developments along with efficient logistic solutions throughout the entire value chain will build competitiveness of the Norwegian seaweed sector. The future production of macroalgae on large-scale and at relatively low cost will open perspectives for using the biomass as feedstock for bulk products (high volume and low price) e.g. bio-fuels and -chemical, and animal feed. Upscaling seaweed cultivation requires specific solutions regarding the technical, spatial and practical integration of the production and will be specific for each production site. Although the current demand for seaweed raw material can be met by cultivating biomass within the coastal zone, large-scale production is foreseen to occur outside the continental shelf of Norway, due to more stable growth conditions and avoidance of conflicts arising with other users of the coastal zone. The Norwegian regulations regarding seaweed cultivation (including monoculture and IMTA) are not yet fully developed. Hence, the cooperation between public authorities, the industry and research institutions is needed in order to develop a knowledge-based legal framework for a sustainable industry based on cultivated seaweed biomass in Norway.